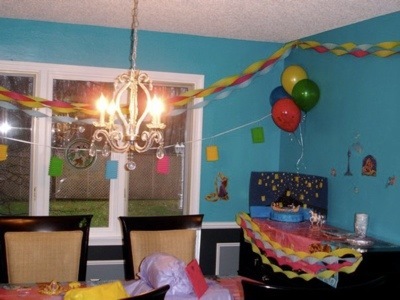 Last year my daughter wanted to have a Tangled themed party. 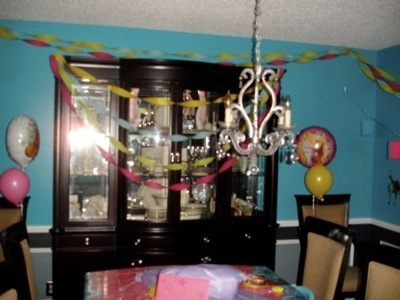 So of course I sought out to make it colorful and fun. 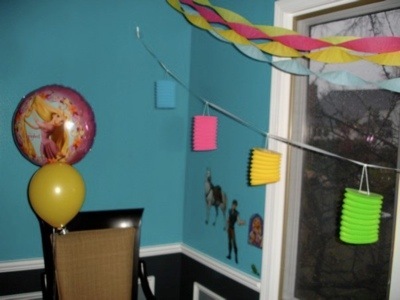 I used lots of different colored streamers to make the room festive, added balloons and even found hanging paper lanterns on a string. 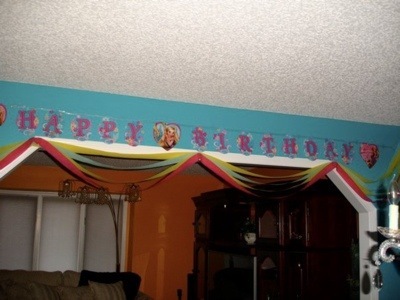 There were wall clings added to the walls and later moved to her room after the party. 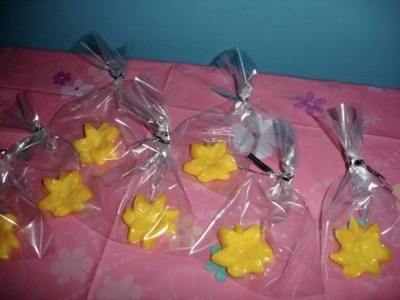 Party favors were simple homemade candy melted into Easter flower molds which look just like the special flower from the sun. 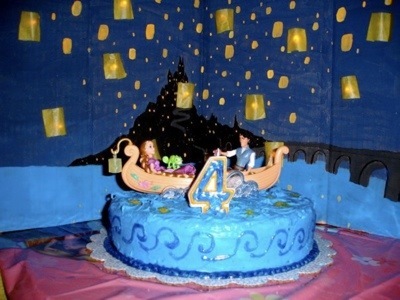 Lastly the cake I wanted to be of Rapunzel’s birthday wish to see the lanterns. 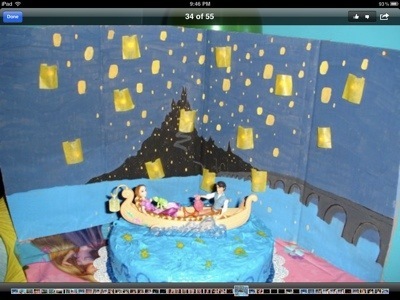 I’ve seen so many pictures of cakes that are of the tower but she wasn’t happy there, so why make something like that for a celebration? 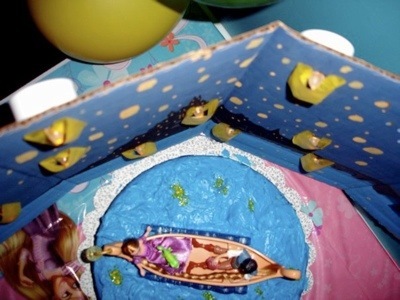 I first bought the small doll set with the boat and made a simple cake and decorated it to look like the water with the lanterns reflecting in it. Next I found a large piece of cardboard and painted the backdrop on it. 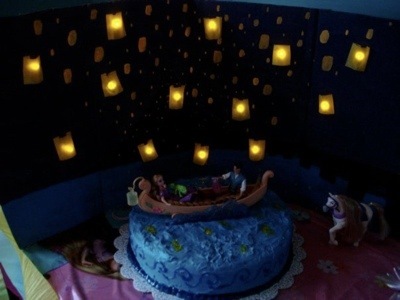 I purchased the little battery operated tea lights and cut the very tip off the flame, I poked through a pencil to make holes randomly where I wanted to put the lights and cut out tiny pieces of yellow tissue paper. Then I glued the paper folded in on each side around the lights. 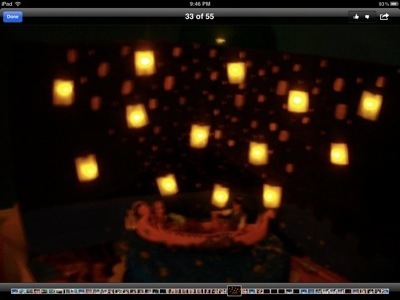 They all created a beautiful flickering effect of real lanterns. Both my daughter and husband were in awe over my creation. The photos dont do it justice. 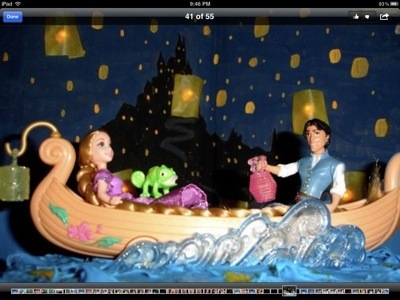 That backdrop was saved and now stays on my daughter’s shelf.